Tower products work! 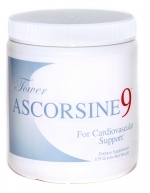 Find out for yourself why Ascorsine-9 (A9) at the proper therapeutic dosage is the fastest working Pauling therapy formula on the market. A-9 is Tower's finest and most potent Pauling therapy drink mix and was previously available only through physicians. This ultra-complete and very popular formula includes everything in the original Heart Technology formula and adds chelated magnesium/creatine, taurine, chondrotin sulfate CS/C, more proline, and more vitamin A. One or 2 jars monthly provides either a preventive (1 jar) or therapeutic (2 jar) daily Pauling therapy dose. Review the most Frequently Asked Questions about the Pauling therapy. Tower's most powerful Pauling therapy drink mix. A one-month preventive (or 2 week therapeutic) supply of Tower's advanced vitamin C, lysine and proline PROFESSIONAL drink mix. Ships monthly. No time requirement. Prompt discontinuation with 7 days advance stop notice before scheduled shipment. NOTE: IF YOU WISH FOR YOUR PRODUCT TO BE DELIVERED ON A DIFFERENT SCHEDULE OTHER THAN MONTHLY, ALL YOU HAVE TO DO IS CALL US AFTER YOU PLACE YOUR ORDER AND WE CAN ADJUST IT TO EVERY OTHER MONTH, QUARTERLY, "X" NUMBER OF JARS EVERY "X" NUMBER OF DAYS, ETC. 702-876-5805 OR EMAIL US AT orders@towerlaboratories.com. Tower's most powerful Pauling therapy drink mix. One jar equals a one-month preventive (or 2 week therapeutic) supply of Tower's advanced vitamin C, lysine and proline PROFESSIONAL drink mix. Wholesale price per jar for 6 jars - $57.80. Tower's most powerful Pauling therapy drink mix. One jar equals a one-month preventive (or 2 week therapeutic) supply of Tower's advanced vitamin C, lysine and proline PROFESSIONAL drink mix. Wholesale price per jar for 12 jars - $53.52.